A sinful woman seems to have been placed by the common custom of mankind outside the bounds of human pity. She is treated as if she were hardly human. Even good men have been quick to condemn her, slow to forgive, unwilling to forget. Evil men are, of course, eager to hold her captive on their own filthy level. Good men are often afraid that a short step or even a slight gesture of pity toward her hand stretched out appealingly may drag them downward into the bog in which she struggles. For just this reason we learn best the tenderness in the heart of Christ for womankind by watching Him in the presence of sinful women. No woman ever sank so low as to be beyond the range of His pitying eyes and of His hand reached out to save her. The woman near the well at Samaria with whom He paused to talk was an adulteress and one He knew to be an adulteress. Yet she was as much in need of the waters of eternal life as if she were a virgin. She was a lost sheep, He the Good Shepherd; and that was all that mattered. The Pharisees evidently were aware of this pity in His heart for unfortunate women, because they attempted to use it as a trap to turn the people against Him. The law of Moses commanded that a woman taken in adultery be stoned to death. So with the cruel cunning of men who hated both Christ and the unfortunate woman, they dragged before Him an adulteress. In their hearts they wondered if Christ would not set aside the Law of Moses rather than condemn this quivering, beaten woman to be crushed under the stones they carried. No matter which way He answered, they had Him. If He freed her, He would defy the law and the people might stone Him. If He bade them stone her, all His fine talk of pity and forgiveness of sins, all His pretended sympathy for women would be blown away in the gale of His command. “Judge her!” they cried, and they were sure that they had caught Him between the law and His pity for womankind. We know quite well the way He slipped through their net and sent these men away trembling and afraid as He wrote in the sand the sins, not of the woman, but of the men, beginning from the eldest. What we sometimes forget is that His pity was so astonishing to a generation pitiless to women that some of the early Christians did not want to believe this incident and omitted it entirely from their manuscript copies of the Gospels. They preferred to think that Christ would not give an adulteress a second chance. From that moment hope and courage dawned in the hearts of sinful women, and even in the depths they looked up into the calm eyes that gazed pityingly and forgivingly upon them. Rather than throw back into her despair a sinful woman who sought Him, Jesus risked a whole group’s possible belief in His claims to be the Messiah. They sat down to dinner, He and the Pharisees, in the house of one of their chiefs. Suddenly the door was flung open and in the archway stood a woman of wondrous beauty. The Pharisees drew back in artificial horror. Mary of Magdalen, a notorious harlot, whose name was famous throughout Judea! Her very presence was a stain on the house of any man. But the woman in the doorway was not looking at the Pharisees, who held their cloaks back from the contact with her. Her eyes were fixed on Christ, who, as He had passed her in the streets, had looked with sorrowing, pitying eyes upon her. Hesitantly she moved forward. Would He draw back from her as the rest did ? In her hand was a box of precious ointment, the gift her woman heart had bought just for Him. She paused near Him, broke open the alabaster box, and then—for she saw that He did not draw away from her as if she were a repulsive thing—fell at His feet, washed them in the great flood of her tears, and wiped them with her luxuriant hair. The Pharisees now transferred their disgusted look from Mary to Jesus. She was a harlot, and yet this man was letting her perfume His head and wash His feet. There He sat in the midst of them while an impure woman touched Him. Whatever faith they might have had in Him tottered to a fall. And though they shuddered piously, in their hearts they were glad. This proved once and for all that He was not the Messiah. For, they argued shrewdly, either He knew who this woman was or He did not know. If He knew and still let her touch Him, then He was an evil man; for a good man shrank in horror when a woman like this so much as passed him in the streets. If He did not know who she was, then He was no prophet, and a notorious woman had completely deceived Him. Jesus however preferred the love of this repentant woman to the possible faith of the proud Pharisees, and at the touch of His pitying eyes Magdalen the sinner became Magdalen the saint. From that day the greatest sinner in the world has not feared to fling herself before the man who has contributed nothing to her shame but everything to her regeneration. Jesus knew that when women stray they have most frequently been misled by their own hot, misunderstood hearts. They have looked for love and found lust, searched for happiness and been caught by its gaudy substitute, given confidence and found betrayal. He knew too how the same souls that are capable of plumbing the depths are often capable, once they turn to Him, of gaining the heights. We may almost think of Magdalen as rising from her knees to walk straight up to the cross on Calvary. 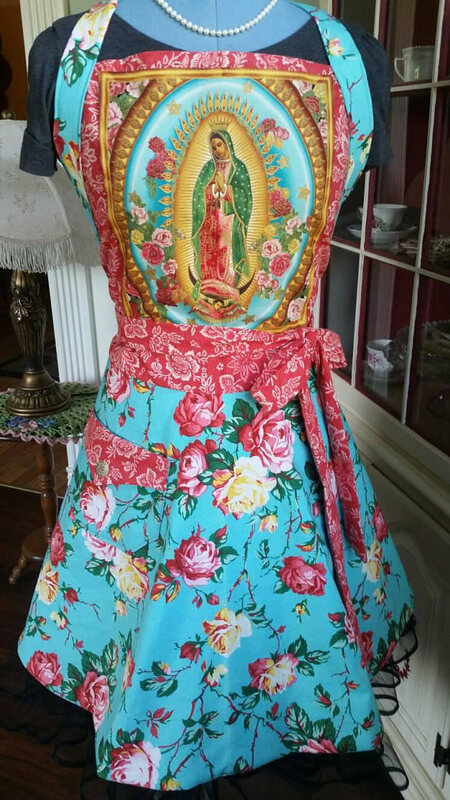 Our Lady of Guadalupe Apron! Feminine and Beautiful! Fully lined, quality material, made with care and detail. Available here. Violet Veil Crocheted Doily Handmade by Rosie. This is a beautiful, lacy, handmade doily made with size 10 crochet cotton. It has been blocked and starched and is ready to decorate and accent your home decor. It is 19″ X 15″ oval. Available here. The book that inspired the blockbuster film, The Passion of the Christ. Faithful to the Biblical account of the Passion, it fills in many hitherto unknown details. Edifying, inspiring, surprising, and heart-rending, Emmerich’s descriptions of our Lord’s Passion will melt a heart of stone. This book is the best on the Passion we have seen. It also wonderfully portrays the Blessed Mother’s role in our redemption. Includes a short biography of Sr. Emmerich. A great book for the whole family! What an uplifting reading for all the poor girls in the world that need to be uplifted in a day when all they think they have left to offer is their body. I hope and pray this reading can help some of them turn their life around. My prayers for all of them. Beautiful, beautiful! Makes one cry at the sweetness and tenderness of Our Lord. Thank you.